The folks at Balvenie like keeping busy. After a summer of random events they’ve hunkered down as we approach the end of the year and have done that which we know them for most – made some excellent whisky. Not sticking with just one dram to tempt us with over the Christmas period they’ve produced two, both long awaited by Balvenie fans and both 2nd editions – Tun 1401 Batch 2 and 40 year old Batch 2. Nose: Vanilla sponge cake with a spot of ginger to start, with some old polished wood and milk chocolate slowly building as it sits in the glass. Touches of red fruit, orange blossom and orange muscat dessert wine, Fry’s Turkish Delight, honey and lemon, sweet marmalade and soft spices. Water adds some coconut. 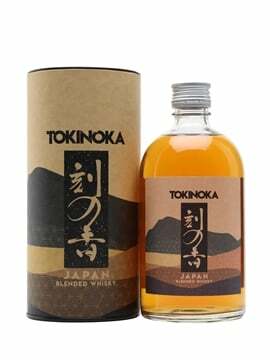 Palate: Soft honey with caramel edges, sandalwood, spiced apple, a burst of orange peel on the swallow and a hint of woody pot pourri at the end. Water amplifies the wood and rolls off a bit of the fruit. 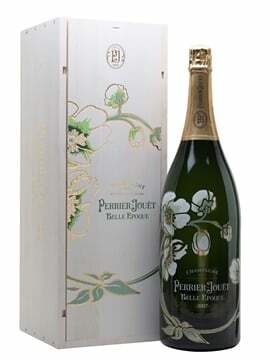 Finish: Candied mixed peel, fresh lemon zest, lingering spice, polished light wood and fruit leaves. 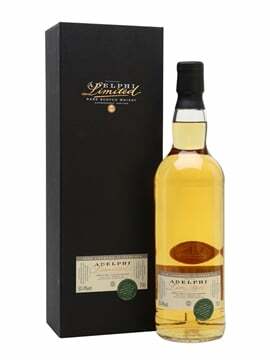 Nose: Lovely apple pie and vanilla flavours, honey, syrup, honeyed oatcakes / flapjacks and top class polished oak. Develops more melony fruit with a trace of cakespice (nutmeg / cinnamon / dried clove). Extremely deft, flawlessly integrated and very appealing. Palate: More upfront and assertive than expected (I’d forgotten it was at 50.6%). Big palate dominated by oak and spongecake (damson jam, for anyone who’s interested). Remains fresh & sappy nonetheless. 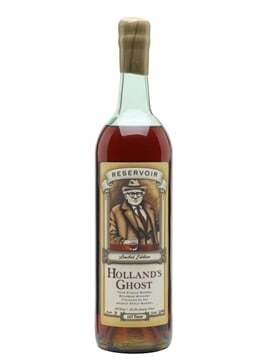 Develops fresh citrus notes, applesauce, aged calvados, brown sugar and fruit loaf. Finish: Long, warm & tingly, with a dry nuttiness creeping in. 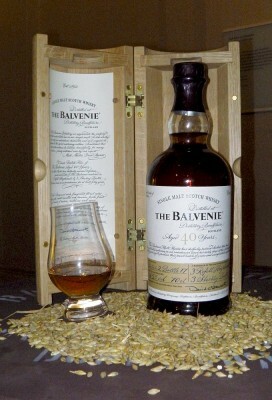 Next up was something a bit special, Balvenie’s new 40 year old. 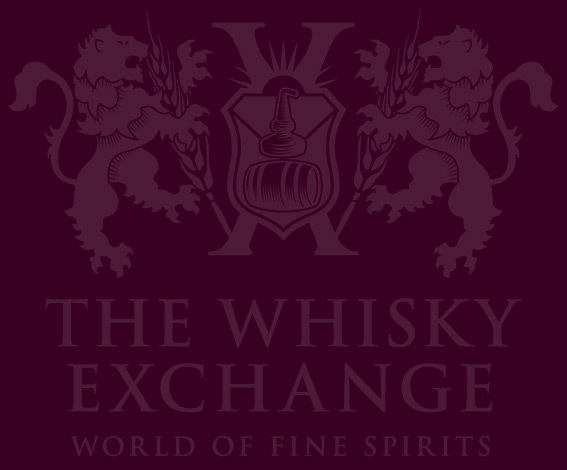 There are only 150 bottles available of this top-of-their-line whisky, with only 18 allocated to the UK (2 of which we drank during the launch event). 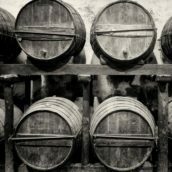 David Stewart was yet again behind this, selecting 6 casks from 1970, 3 sherry and 3 bourbon, to use to build the whisky. If six 40 year old casks only yielded 150 bottles it would be a sign of some very hungry angels and David didn’t use the entire contents of the casks. In the end the finished product is about 2/3rds sherry matured and 1/3rd bourbon matured whisky, and is bottled at a full proof of 48.5%. Nose: Elegant old sherry wood, very floral honey, maple syrup, treacle toffee, wood polish on a surprisingly new wood floor, bits of old stained wood, fig rolls, a hint of green leaves and a slab of rich vanilla sponge cake. Palate: Creamy vanilla, lemon zest and excellently balanced spicy wood: Cinnamon and nutmeg laced eggnog? Lemon egg custard tarts? A turn towards a tannic edge as you swallow, along with some old cognac rancio, with autumnal forests and damp wood. Comments: Surprisingly fresh for such an old whisky, with a nice balance between sherry and bourbon. 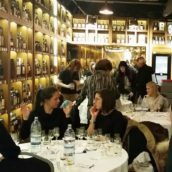 They could have gone down the more common route of bringing out a sherried beast, but instead have stuck to the distillery character and built the sherry around a honeyed bourbon cask centre. Good work, Mr Stewart. Further emphasising the ‘we love craft’ message, each bottle is packaged in a wooden box hand made by Scottish furniture maker Sam Chinnery and then engraved by his father. It’ll hit the market at about £2500 and we have a bottle. Edit: We had a bottle. Someone’s already bought it. We’re trying to get another. Let us know if you want one. BTW, due to creative differences here at TWE Blog, let’s have a poll. What colour do you think our editorial italics should be in? Vote now! Very nice. 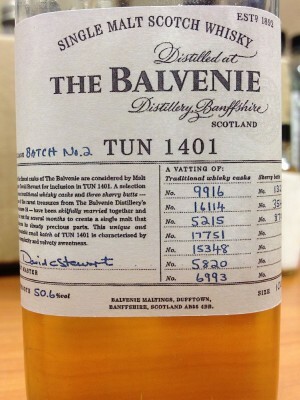 I had the plaeasure of tasting tun 1401 Batch 2, and it’s a stunning whisky. that session of deconstruction was very nice, althiough i only was a viewer and did not take part. i have batch #3 (US only) waiting for me to taste it, and i have very high ecpectations as batch #2 is one of the best i’ve had recently. i never had the 40 yo. u are lucky mate.